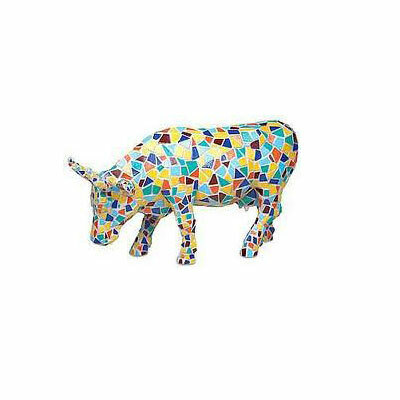 Moozaic | CowParade New Figurines | One Price Low Flat Shipping! From the CowParade Retired Cows Collection, Moozaic. Designed by artist, Joe Boeckholt. Featured at the CowParade Kansas City 2001 exhibit. Made of resin. Measures 4" x 6". Brand new in box. 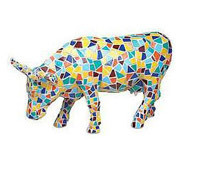 Moozaic cow is covered in broken pieces of colorful dinnerware. The artist collected Fiesta ware and other lines of dinnerware for years. The damaged pieces that he amassed became the inspiration. They were broken up, adhered to the cow, then grouted. ?Conceptually, Moozaic can communicate many ideas, from diversity to commerce to recycling, but if you just enjoy her colors, she? 's happy,? said artist Joe Boeckholt.